What and where is the geos in geopolitics? 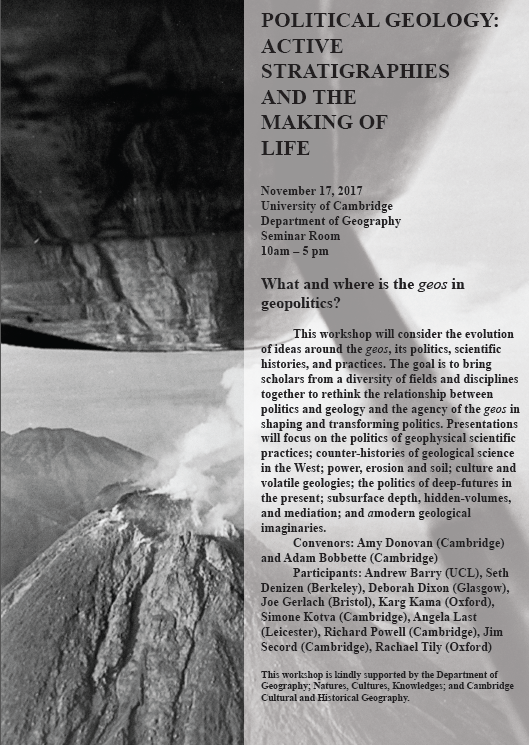 This workshop will consider the evolution of ideas around the geos, its politics, scientific histories, and practices. The goal is to bring scholars from a diversity of fields and disciplines together to rethink the relationship between politics and geology and the agency of the geos in shaping and transforming politics. Presentations will focus on the politics of geophysical scientific practices; counter-histories of geological science in the West; power, erosion and soil; culture and volatile geologies; the politics of deep-futures in the present; subsurface depth, hidden-volumes, and mediation; and amodern geological imaginaries.